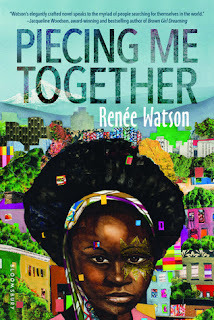 A couple years ago This Side of Home was one of my favorite reads so when I found out we were getting a new Renée Watson book this year it automatically became one of my most anticipated reads. Piecing Me Together lived up to all my expectations and then some. Jade lives in north Portland but goes to the fancy private school St. Francis on a scholarship. She knows this is her greatest opportunity to go to school and get out of Oregon. It can make her feel like she is living a dual life though. Her first two years there were successful academically, but she didn't make many friends. As her junior year begins, Jade is asked to join a mentor/mentee program for "at risk" girls called Woman to Woman. She's not really sure she needs it. She doesn't feel at risk, and she definitely doesn't feel like her mentor, Maxine, is going to be very helpful in teaching her about the real world. But as the year continues to go less the way Jade expected, the more she learns about the pieces of her life that make her everything she is. Jade's voice is pitch perfect. As soon as I started reading, I was fully drawn into her world. Jade's favorite school subject is Spanish. She loves studying it and is looking forward to doing a stay abroad. Each chapter begins with a Spanish word and its translation. The chapters are short and each word and beat remains in form and step with Jade's character. Jade is also an artist who works in collage. She likes to make things people consider trash into things of beauty. Her most recent obsession is York, the slave of Clark (of Lewis and Clark fame) who helped with the expedition. She is creating work that involves him and also black women who have suffered at the hands of official brutality. Her art and her love of Spanish are integral parts of who she is and both morph over the book as her character changes and grows. The mentorship program Jade is not super excited about is helpful to her, helping her find her voice and become more of an activist. The novel is episodic, moving quickly through the school year. This works really well and lends itself well to the authenticity of the novel and Jade's character. When you think about it, life is episodic. Most of our days are routine, and there are pivotal points that stick out from the regularity of life. The strength of the novel is in Jade herself and her journey, but also in all the relationships. This is a female centered story and it features incredible female relationships of all types. Jade finally makes a real friend at St. Francis her junior year. Sam is a new white girl who rides Jade's bus. Their relationship begins out of proximity and convenience but grows into one of true sharing. They have a lot of roadblocks because of their different ways of seeing the world, but the way they interact and work these is wonderful. Jade's best friend from her neighborhood is also a fabulous example of female friendship. Jade and Lee Lee are close like sisters. Their relationship is old and often doesn't need words or explanations. Despite going to different schools and spending long times apart, they have remained close and work hard at keeping their friendship going. I loved the way the three girls interacted with each other when they were together too. Lee Lee and Sam both recognize their individual importance in Jade's life and get along well together. I love books that feature strong female friendships, and Piecing Me Together excels at this. Jade's relationship with her mother is another important one. Jade's mother was a teen mom and she works long hours to pay rent and buy food. She doesn't see Jade as often as she wants but makes the most of the time they do share and has big dreams for her daughter. Her relationship with her mom is part of why Jade doesn't feel at risk. She knows she is loved, she gets good advice, and is given a chance to live her dreams. Her mother has mixed feelings about the program too. She knows it will help Jade get a scholarship to college, but she feels judged and is a bit resentful of Maxine at first. The relationship between Jade and Maxine is integral to the book and I loved what Watson did with this. Maxine is a recent college graduate so is not much older than Jade. Jade wonders exactly what Maxine could teach her and if maybe Maxine herself needs a mentor because her life seems kind of out of control. As Maxine and Jade grow closer, they actually teach each other a lot. The best part of this to me is that Jade's mom pulls Maxine into their world too and sort of becomes her mentor and it is a beautiful thing. All of these women are independent women with different strengths and weaknesses that balance each other out and combined they make Jade's life richer and are the center of the story. The prose is truly excellent. There are whole sections of the books I would love to quote, but won't because I read an ARC. And if I quoted everything I loved loved, half the book would be here. Who should read this book? I think everyone should. It is my favorite YA read of the year so far, and I'm going to be talking about it a lot. I read an ARC obtained from the publisher, Bloomsbury Children's, at ALA Midwinter. Piecing Me Together goes on sale February 14th. It is! I love that it focuses on girls and their relationships too.